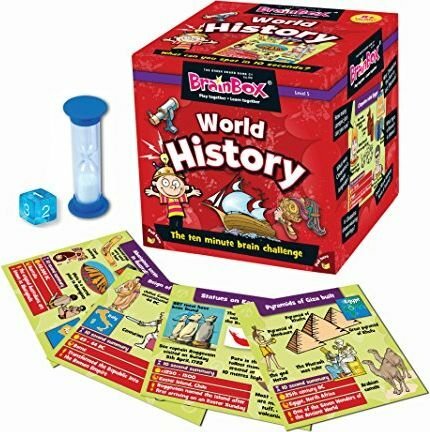 BrainBox for Kids is a fast and fun memory game that does not require any pens, pencils, paper, playing board or even a table! BrainBox World History Game contains 55 cards featuring fun facts about famous people and events in the history of our fascinating world. The Brain Box Game is beautifully-illustrated, well researched and pure fun. Players will have 10 seconds to study a card before being asked a question from the back, chosen by the roll of the die. If the question is answered correctly the player keeps the card, if not, the card must be returned to the box. The player with the most cards after 10 minutes wins the game. This fabulous game is about observation and memory, not learned facts, so you never know who's going to win. About 10 minutes of game play is the norm, but playing for 5 minutes is great fun also. BrainBox is educational and is perfect for families and groups of friends to play, wherever they are. The game comes in a sturdy cool magnetic cube box, and it's ready to play without any set-up time needed. For 1 or more players ages 8+.